Giuffria was a melodic and majestic mid 80s heavy metal band, and founder Gregg Giuffria often referred to their music as "cinema rock." They had some minor commercial success before constant line-up changes killed all momentum. 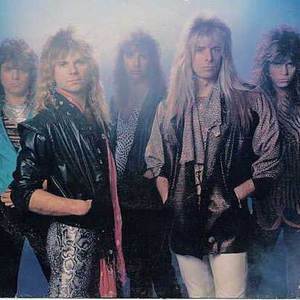 Former Angel keyboardist Gregg Giuffria was going to stage his comeback under the Angel banner, however former members of the band convinced him to use a different moniker. Giuffria named the new band after himself and recruited David Glen Eisley (vocals), Craig Goldy (ex-Rough Cutt, guitar), Rick Bozzo (bass) and Alan Krigger (drums). Bozzo would be replaced by Quiet Riot's Chuck Wright before recoding of the debut commenced. The self-titled debut album was an almost technically perfect recording, spawning the Top 20 hit "Call To The Heart" and turning the band members into stars in America while touring behind the newly reformed Deep Purple. After the tour Goldy and Wright both left the band - Goldy would join Diver before moving on to Dio. Lanny Cordola was brought in on guitar and David Sikes took over bass duties for the second release Silk + Steel. Even though the new album followed in its predecessor's footsteps, sales were poor and the band was quickly dropped from their record label in 1987. Kiss' Gene Simmons showed interest in signing the band that now included Giuffria, Cordola, Wright and Ken Mary on drums. However Simmons insisted on a name change, and thus House Of Lords was born.